In less than three weeks the refurbished hull of a Second World War era submarine will be revealed for all to see. Piece by piece the scaffolding surrounding HMS Alliance at the Royal Navy Submarine Museum, in Gosport, is being taken down. The final section is due to be removed early next month. It will be a major milestone in a project that has already seen many. Sitting atop her home on a concrete cofferdam, she will, for the first time in decades, be looking her best. A gleaming black finish – itself painted on top of anti-corrosive paint and a holding coat – will mask the major work embarked upon in October 2011 to restore her. Alliance had suffered such corrosion that huge parts of her were damaged so badly they had to be replaced, rather than repaired. But he added if this project had not been started, the ‘irreplaceable’ submarine would have been lost to the public. ‘Eventually I think she would have been in such a poor state you couldn’t have opened her to the public,’ he says. ‘She would have become a health and safety hazard to people surrounding the submarine because bits were dropping off. ‘And also she would have been an environmental hazard because the rust and the paint coatings, all of which are not supposed to be in the water, gradually dropping off and contaminating the sea around us. ‘And she is the only surviving Second World War submarine – she’s irreplaceable. She is also a memorial to the 5,300 British submariners who have lost their lives in service. At the end of £6.7m project in March 2014, Alliance will have been bought another 60 years. To get to that stage, the restoration so far has been nothing if not extensive. Around 40 tonnes of new steel has been put into the boat to replace parts that were beyond repair. Bob adds: ‘The restoration itself has included absolutely everything. ‘Down at the bow, by the bow’s keel, we’ve had to restore from the bottom of the keel all the way up and all the way down. ‘All of that has been blasted back and repainted and a lot of welding repair work carried out. ‘The bow is a very good example of the challenge of producing a really good restoration in terms of the quality of workmanship. The work has been guided by the 1945 original build drawings, supplied to the museum by BAE Systems at Barrow-in-Furness. But that has not made it plain sailing for Portsmouth-based firm ML UK which has carried out the work. Getting access to certain parts has been difficult. That included the ballast tanks, which could only be accessed by cutting through the hull. ‘There are dozens of ballast tanks aboard Alliance,’ says Bob. ‘Every one of them has had to be opened up, blasted and repainted in order to preserve the interior. ‘The shot blasters have had to go in there and blast all the rust away, the painters have had to go in there and paint. ‘Some of the work in the confined spaces has been challenging. ‘It’s in the nature of the way submarines are constructed, they’re not the easiest thing to work on and maintain. ‘There’s so much machinery crammed into confined spaces. A major consideration during the restoration work has been safeguarding against any future corrosion. And that has meant protecting the boat, which is on the historic ship’s register, against birds. The A-Class’s casing has more than 100 distinctive free-flood holes. But each one of them is now covered with mesh to stop it becoming an aviary. Bob said: ‘A lot of the superstructure of a submarine is free-flood, so when it dives, water floods into these spaces, which is obviously meant to happen. ‘The problem with a preserved historic submarines is that birds like to go in there and nest. ‘Every one of these free-flood holes, and they’re all over the hull of the submarine, has to be meshed over. ‘Birds contaminate the boat with their guano but they also make it unhygienic to work on. ‘At the height of the problem there were probably 200 birds nesting or associated with the boat. Instead, regular groups of visitors can be found aboard, being shown around by one of the museum’s many volunteers. When the programme of work is completed, visitors can see what it was like for 65 crew and six officers that used to be on board. A state-of-the-art sound and lighting system will bring the boat to life. She is open for visitors now and museum staff are keen to share their enthusiasm for her with others. 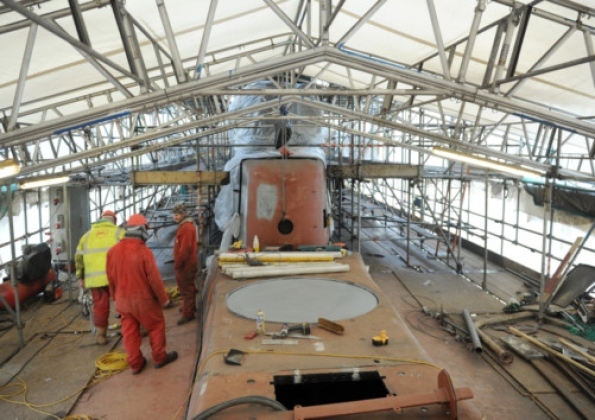 JUST as museum staff want the submarine to be open to the public, so is the restoration work itself. An army – or crew – of volunteers has been taken on to help with the work. Roy Furse, a former member of the Fleet Air Arm, is a conservation volunteer. The 67-year-old, from Seafield Road, in Portchester, will be working on bringing some of the electronic equipment back to life. He was busy in a workshop at the museum when he spoke to The News. He said: ‘I’ve been working on the submarine. ‘I’ll be working on the electronics, which is quite exciting, trying to get some of it working again for lights and visual effects. ‘I worked at IBM for 28 years in project management and needed something really different and this is it. Mr Furse has been volunteering on the project for three months. Volunteers are given initial training but are given space to fit into the project. Curator Bob Mealings added that the museum hopes the volunteers involved will stay for the long term to help with the upkeep of the fully-restored vessel. He said: ‘We’d like people around to help us maintain the submarine in the long term. To volunteer on the project, call (023) 9251 0354, extension 231. EVEN after getting £3.4m from the Heritage Lottery Fund, refurbishing a submarine is a costly business. Bosses need around a further £200,000 to hit the project’s target. Those behind the £6.7m project run fundraising events to bring in more cash to pay for the work. And this week a travelling speaker, with the stage name of Eric, will be talking at the museum to help bring in the cash. Fresh from a world tour, which included Australia, London and Leicester, the former submariner will talk about the secret world of submarines. Tickets cost £10 for the show on Thursday at the museum. Then on Thursday, July 18 from 7pm to 9pm, the museum’s own archivist will give a talk. George Malcolmson will give his talk, Donald’s Navy 1900 – 1945, about the seaside artist Donald McGill. And on Thursday, September 12 a dinner aboard HMS Victory will raise cash for the ongoing restoration. Diners are invited to enjoy fine dining and fine wines on Admiral Lord Nelson’s Lower Gun Deck in aid of the restoration appeal. The night will be in full naval tradition style and will end with a prize auction. All tickets can be bought online at supportusalliance.co.uk or by calling (023) 9254 5036. This entry was posted in UK Submarines and tagged Gosport, HMS Alliance, Royal Navy, Royal Navy Submarine Museum, Submarine on June 20, 2013 by jasonlockley.